First, it is a matter of social and environmental justice. When corporate profit is privileged over the health of our lands and waters, we all suffer. When government stifles debate, democracy is diminished. Bill C-45 is just the latest in a slew of legislation that undermines Canadians’ rights. 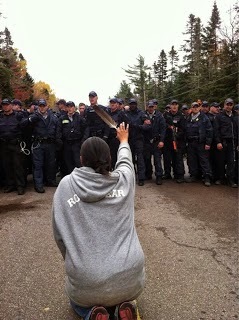 In standing against it, the First Nations are standing for us too. Second, as Justice Linden of the Ipperwash Inquiry said, “we are all treaty people.” When our governments unilaterally impose legislation on the First Nations, they dishonour the Crown, they dishonour us, and they dishonour our treaty relationship. We are responsible for ensuring that our governments fulfill their commitments. If our governments do not respect Indigenous and treaty rights, then the very legitimacy of the Canadian state — and thus of all our citizenship rights — is in doubt. That’s what Idle No More is about.